How to Listen To Ministry Audio Or Video. Pay for items on the www.lsmwebcast.com site on a per-view basis. The Life Study of the Bible radio broadcast archives. Regional conference audio at church websites. How to Sign up: Step-By-Step Instructions. Two Different Ways to Download Messages. Click the Standard Quality Download Button. After you have listened to the message you may delete the downloaded file, if you wish, to save disk space. In any event, you should delete the file after 30 days since it will no longer work after that time. Playing Messages on CD or MP3 Players. The Types of CD Disk. The Types of CD Disk Formatting. Making a CD that will play on an mp3 Player with Windows XP. Method 1: Step By Step Instructions. Method 2: Step By Step Instructions. Playing Messages from the Music Submenu. If you do not want to subscribe to the LSM service, these are a few ways to obtain ministry audio. As a "non-subscriber" you can view video messages from the "Additional Content" portion of the website for $2.50 each, or you can purchase 10 'per-message-credits' for $20.00. These 'per-message-credits' do not expire and can be used at any time. The cost is $9.95 per month (as of 4/08), and you will need a credit or debit card. The subscription fee pays for the Basic Content section which includes all Wednesday Night ministry videos from the most recent term of the FTTA, the most Recent Conference videos (New Years, Memorial, and Thanksgiving), and the Witness Lee Archives which are conferences and training videos which are sometimes related to the recent speaking in the conferences. In addition to this, you can also purchase messages from the Audio Archives which includes audio of the most recent trainings for $1 per message, as well as many other archived messages. Finally, there is an Additional Content section, which contains other video messages which can be viewed for $2 each. You can also purchase 10 "per-message-credits" for $10.00. On the next page, create a User Name and a Password and click "Sign In"
On the next page, fill in your account information, and click "Update Information"
On the next page you will be asked to enter your credit card information. If you've never purchased anything online before, be aware of the following things. If the address information you enter does not match what is on file with whoever issued your credit card, your card may be rejected. If it is, try again or contact your credit card issuer to verify what address information they have. Also, after entering your credit card information correctly, you may be asked to create a separate password related to that credit card (VISA does this, for example). Once your credit card payment has been accepted, you can sign into the www.lsmwebcast.com website and access the messages anytime by clicking on the category (such as "Wednesday Night Archives") and clicking on one of the message titles. You will then be brought to a page that contains the "play" button as shown below. There are different ways to play messages. If you have a fast internet connection, you can use the "play" button and listen to the message as it is being downloaded to your computer. Instructions are given for this first. The Windows Media Player should automatically start. This applies to both video and audio messages. Then, a License verification window should appear as the website checks your User Name and Password to make sure you're a subscriber. If everything is set up properly, a "play" button will appear in that window and by clicking it the message will be allowed to start. At this point you might get a message telling you to update your Media Player, or possibly a "License Acquisition Error." Both of these problems can often be fixed by updating your computer at www.update.microsoft.com. Or, if you are asked you can try going through the update process. it reduces the pauses that can occur when there are delays or problems with an internet connection. Click the Save button and then you'll be given a chance to place the file somewhere on your computer. Be sure to note where you've placed it so that you'll remember later. A video message is about 180 MB in size and takes about 2 hours to download on a 256K DSL connection. Since it takes so long, you might want to download at a time when you wont be using your computer and then come back to it later. If for some reason the internet connection gets interrupted during the download, you'll have to start the process over from the beginning. Once the message has downloaded, make sure you are online, and double click on the downloaded file. The Windows Media Player should automatically start, and a License verification window should appear as the website checks your User Name and Password to make sure you're a subscriber. If everything is set up properly, a 'play' button will appear in that window and by clicking it the message will be allowed to start. At this point you might get a message telling you to update your Media Player, or possibly a 'License Acquisition Error.' Both of these problems can often be fixed by updating your computer at www.update.microsoft.com. Or, if you are asked you can try going through the update process. Although you must be online in order to go through the license checking process, once the message has started playing you don't have to be online anymore since your computer itself will just be playing the file rather than accessing anything online. LSM protects its audio and video files with Digital Rights Management so that they can only be played by those who have purchased the right to play them. If your audio player can handle the DRM-protected files you can transfer them to your MP3 or CD player as described below. Otherwise you will either have to obtain a different audio player, or convert the file to a format that your audio player can handle. To make a CD you must have a computer which can burn CDs. Also, which type of CD used depends on the device which will play them. The cheapest kinds of CDs (CD-R) are made to be written to only once, yet these are the ones which are most compatible with all sorts of CD and mp3 players. Therefore, it's best to first test on a CD-R before trying other types of CDs. Another common type of CD is a CD-RW disk. The 'advantage' of these is that they can be erased and used over and over again. The disadvantage is that they are not compatible with most CD and mp3 players. They also cost more than CD-R disks. DVD disks are yet another type of disks. These look the same as regular CD disks, but hold about 7 times more content. Like CD-RW disks, however, they are not compatible with most CD and mp3 players. However, both CD-RW and DVD disks work fine on most modern computers. CD disks are usually 'formated' either as a 'data CD' or an 'audio CD'. The 'data CD' method is what most mp3 players make use of, and the 'audio CD' method is used in more traditional 'CD players', such as found in many cars and home stereo systems. First open the folder containing the messages you wish to place on CD. Then, place the CD into the CD drive, open the CD drive folder (Start >> My Computer >> CD Drive), and then drag the mp3 files you want to place into that CD drive window. You'll see something like the windows below as you do this. The computer is not yet 'burning a CD', but rather it is only copying the files to a temporary location before burning the files to the CD. After that step is finished. You should click the 'Write these files to CD' (which should appear on the left side of the CD window). This should start up the CD Writing Wizard dialog. You don't need to change the CD name, but you can if you like. Then click 'Next'. If the CD in the drive is an empty CD-R type CD, then you'll see a screen like the one below. This is because this is the type of CD that can be used for recording 'Audio CDs' (see description of Audio CDs vs. data CDs above). As mentioned earlier, making an Audio CD is less desirable for several reasons. If you have an mp3 player or more modern CD player, choose the 'data CD' option instead. This saves a lot of space. You may then see a window such as shown below. Do not check the "HighMAT" check box. Instead, just click 'Next'. If you choose the 'data CD' option, it will then display a window saying that it's "Adding data to the CD image". If only one message is being placed onto the CD it might only take 1-2 minutes. But if you've dragged many files to the CD, the process can take much more time. When it's done, the CD tray should pop out meaning that the CD burning is complete. If you choose the 'Audio CD' option, Windows Media Player will start up and if you choose View>>Go To>>Burn you will see a list of the files which you earlier put onto the CD window. You can start up Windows Media Player yourself and then use View>>Go To...>>Burn and then choose from the menu at right either of the following: "Audio CD" or "data CD". It then asks you to insert a CD into the drive. Make the Windows Media player small enough, so that you can also see the folder which has the message files in it. Then drag the folders you want to record to the "Burn List" (which is on the left side of the window). Then when you have all the files you want to record listed on the left side, click "Start Burn." When the recording is finished, the CD tray should eject. and then press the central button again. 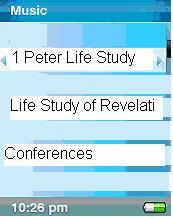 In the example at right, the messages available are from 1 Peter, Revelation, and Conferences. Once you select the category, a final screen will appear from which you can choose which message to listen to. The MP3 player is LOCKED when you can see ORANGE next to the Lock Switch (4). When locked, none of the buttons on the player can be used. This is useful at times when you want to avoid accidentally pressing buttons while playing a message. You can find out how much space is available on the MP3 player in the INFO submenu under the SETTINGS menu. The example above shows that 5662MB is available, the e250 MP3 player actually only has about 2000MB total.